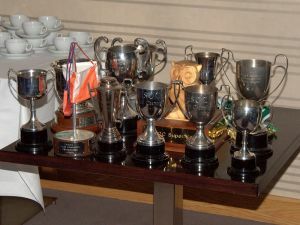 Everyone enjoyed the prizegiving social at Swanston Brasserie, with a buffet before the trophy presentation. 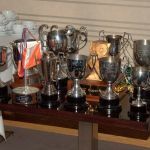 Most had competed earlier that day at the East of Scotland Championships (at Dechmont Law, Livingston), which was also the ESOC Club Championships Cup. 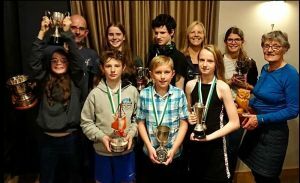 See the ESOC Club Championships 2018 news item for a full list of the prizewinners in the Club Championships Cup and also the senior Club Championships League. Well done to all the winners! Walter Clark, club president, also presented the John Colls Award. 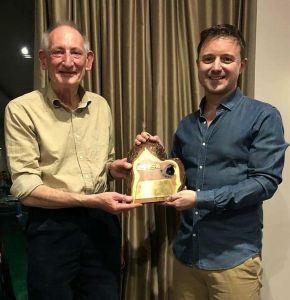 This annual award was set up in 2016 in memory of a former member who made a huge contribution to ESOC as well as both Scottish and British Orienteering. The trophy was presented to Ewart Scott for his enormous dedication to ESOC. Ewart has been an ESOC member since 1969, and was recently president of the club from 2015 to 2018.